Al Robertson, a resident of the Northeast Kingdom of Vermont, chose to live vertically long ago, and has been doing so for almost 15 years. How does he do so, you ask? Well, Robertson resides in a silo, seemingly hidden amongst the tall trees of his 60-acre tree farm. The inspiration for this unique dwelling came from Robertson’s vast travels in Europe. After working as a civil engineer for the Reserve Officers’ Training Corps (ROTC), he was sent to Germany as a civilian. It was during his travels – exploring castles and drinking beer – that he began to admire the way the Germans had a deep respect for their forests and trees. Upon returning to the U.S., Robertson decided he wanted to buy a piece of property where he could enjoy the landscape, preferably nestled in thick woods. He set only a few rules for himself as he began the search for the perfect property: cheap land, low taxes, and no poison ivy! He felt that Vermont made the most sense at the time since upstate New York was somewhere he enjoyed, Maine was too far, and the taxes in New Hampshire were too high. Back around 1983 when he purchased the land, it was very cheap. The parcel he bought from was going for $300 per acre and the whole parcel at 800 acres was going for $200 per acre. He wished he had bought more at the time since now you can’t find any land for sale and if you do find some it will cost you from $4,000 - $6,000 per acre. Originally, upon finishing the road up to his property, Robertson thought he would build a normal home in this wondrous space. However, after a few beers with friends and a climb up a spruce tree, he realized that he needed to take advantage of the location and spectacular view. Since much of his inspiration came from the Bergfrieds in Germany, tall towers typically found in German medieval castles, it’s no surprise that Robertson decided to build vertically. He wanted to create a home with an incredible design, even if it was an engineering challenge. What resulted from all his hard word is this amazing silo home. The dwelling has ten levels including a kitchen, guest room, master bedroom, TV room, library and more. 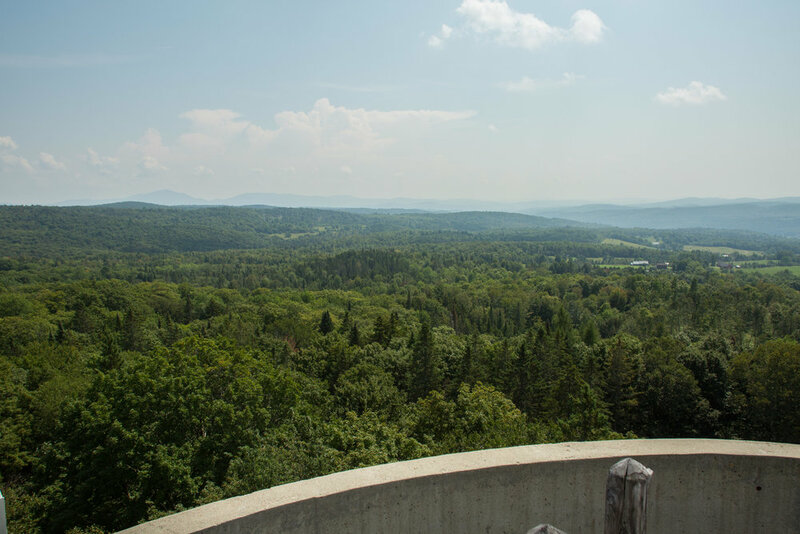 It is complete with a deck on top, which yields beautiful views of the Vermont wilderness. From the top on a clear day you can see Mt. Lafayette in New Hampshire in one direction and Mt. Mansfield in Vermont in the other. Al says it is one of the best places to view the stars at night and the countryside, but one must be aware of the harsh storms and winds that come through. The area has some extreme winds for a lower elevation, so he spends quite a bit of his time repairing wind damage. The upper deck is fitted with lightning rods that ground the silo, but it has in fact been struck by lightning a few times. Next to where the silo stands is a garage. To get there you have to go up a winding driveway that passes apple trees and berry bushes, a small garden, and a few signs that lead to different pathways and trails around the property. Robertson’s 60 acres of land is also home to a tree farm, but not a Christmas tree farm as you would expect. 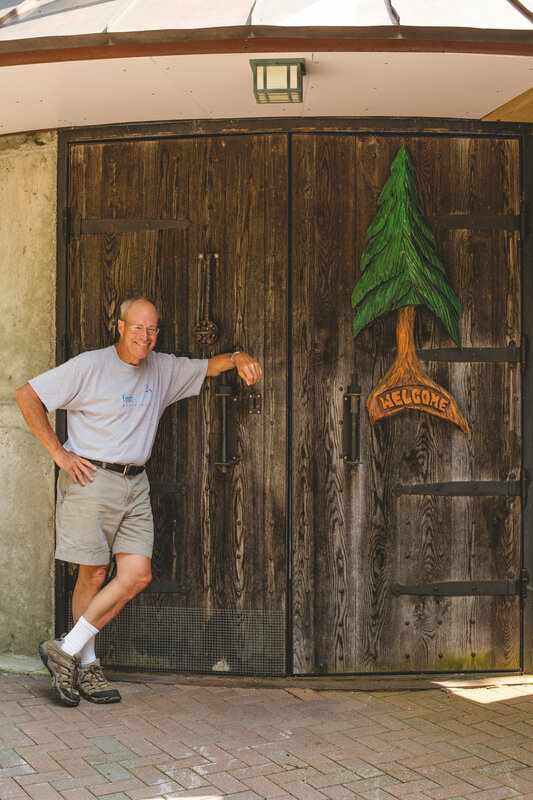 His farm manages and raises an uneven age-class of trees throughout the property. With these he produces very high quality timber that is used as saw logs for lumber, hardwood for furniture, pulp for making paper, and firewood. His goal is not to get rich off of the land, but rather to improve the forest.